I have to admit I’m biased, Montana is one of my favourite places on earth. 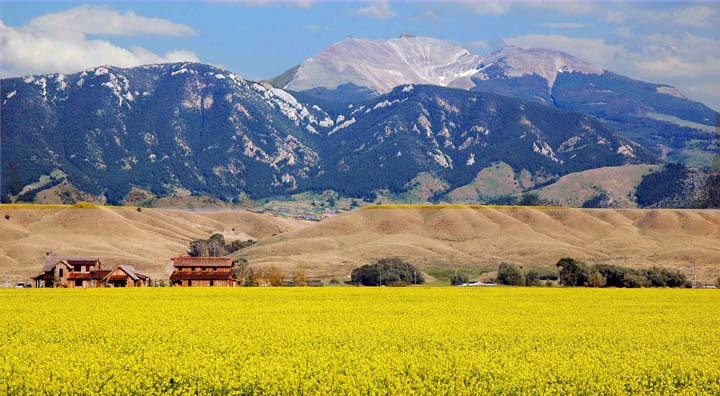 I got married there a few years back and spent a blissful honeymoon exploring the wonders of the ‘Big Sky’ state. When invited this year by American friends to return for a fishing trip, my mind went in to overdrive on how to achieve it. To cut it short, I offered my wife a chance to revisit romantic times past and she trampled all over me to grab at the opportunity. Fifteen odd hours after closing the shutters on our cabbage-patch garden in London, we were ensconced in a spacious, well appointed log cabin with views from the windows that were nothing less than heroic. No wonder rural American's express such religious fervour for their land, because this is truly God's own country. In front of us, and what seemed within touching distance was the grandeur of the Rocky Mountains. Below us running east to west, and on and on into infinity, the incomparable vistas of the Madison Valley. And somewhere tantalisingly out of sight within it's folds, the trout-filled waters of the Madison River. Pinch me, someone, I've died and gone to heaven. I first clapped eyes on Gary Evans ten years ago whilst rattling across a railway sleeper’ed bridge to his fishing camp. Gary was a giant of a man in his early thirties, fashioned in perfect harmony to the epic proportions of his land. Now, still courteous and master of laconic communication he introduced me to Dallin, his head guide and my float fishing companion for the day. Formalities over, gear stowed aboard a specially designed Dory, we pushed out into the waters. Dallin at the rear with the oars, controlling and directing our descent; me wedged inside an elevated casting platform, the magnificent Madison river opening up before me. We were soon at a stretch with an inviting bank and anchored within casting distance. Streamer fishing is not my favourite method but Dallin urged me to try as this bank was home to large, voracious browns that loved to chase a fast-stripped fly. He wasn’t wrong; third cast of a large articulated streamer and I tightened into a beauty of about 2.5 lbs and successfully brought it to the net; fat belly gleaming golden under a hot Montana sky. Some start! But I couldn’t tempt another before we’d fished through the bank. And then we settled down to the real business of the day. 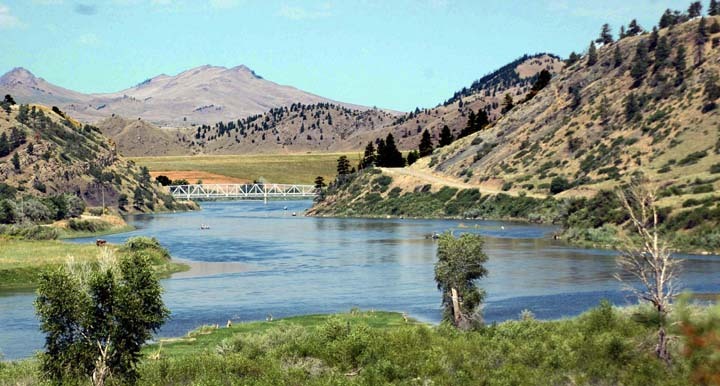 Float fishing large Western rivers like the Madison is the only way to successfully cover the many options unavailable to wade fishermen. Your guide is reading the waters ahead, advising of the upcoming lies, steering you over hot spots and keeping you in synchronous drift with your fly. So not for me the usual few meagre feet of drag-free drift or the maddening incompetence that lands my fly short of some far fish-filled patch of water. Dallin was taking me cruising down fish highway and he knew all the lay-bys where the finned traffic parked up nose to tail. Conditions on the day dictated the use of a 2 nymph team fished under an indicator, forever on the look out for its merest hesitation. In truth I missed the first couple of takes and then fluked into a fish as I pulled off to recast. This one a Rainbow and it gave me a hell of fight! The rest of the morning produced mainly Whitefish (although a strong fighting game fish they lack the charisma of their Salmonid relatives) After a couple of hours fighting the currents even a guy like Dallin needed a rest. He beached us on a long gravel island in scenery straight out of a John Ford western. I was surrounded by cliffs of a high sided canyon towering to an immense western sky; the snow melt waters of the upper Madison tumbling either side of me on their long journey to the sea. What was that James Stuart western, called? ‘Winchester 73' ‘Where The River Bends’, whichever, surely this was the place his noble character was laid to rest. Refreshed from the contents of our cooler we set off once more down fish highway. In truth, I’d had it with the indicator and nymphs and opted for the dry. Dallin produced a ‘Royal Trude’ (a sort of general attractor pattern with sedge-like characteristics) and it soon proved deadly. Dallin’s eyesight for a rise was a keen as the native bald eagle’s. He eased out of the main flow, approaching a calm, boulder-free run, bankside decorated and shaded under tall western pines. Good dry fly water, and he’d already spotted a rise (unseen by me ) on the way in. The drift was slow enough to cover the shallow waters without haste, the bank within easy distance for the gently gliding attractor. The rise to my Trude seemed in slow motion, likewise my dreamy reaction, then the split second tighten on the line jerking me back to reality. A brownie on, powering out and away into the main current. No way to fight it back against the strong flow; gaining line only as we pursued its flight down stream. It was a heart pumping ten minutes of non-stop action before Dallin beached us on a gravel bar, jumping out with the net. What a fabulous fish lay panting in the shallows, all of three pound; flanks fattened on a diet of enormous golden stoneflies, hatching prolifically over the previous few weeks. Dallin gentled it back to strength, I watched mesmerized as it slid off to deeper waters. Another similar episode followed not long after. And those two fish alone, reward enough for the day’s efforts. More obliging whitefish followed, interspersed with a couple of good Rainbows. But no more browns before we finally arrived at the take-out, some five miles down stream of our departure. What a journey: another unique and wonderful fishing experience. My wife picked me up, and yet again, on the thirty mile journey back to our local town of Ennis, we were awed to silence by the grandeur and immensity of Madison Valley’s vistas. Most of the next five days were spent sight seeing, including touring Yellowstone Park: Grizzly bear and Wolf enclosures, free roaming herds of Bison, Moose and Elk. And a network of wonderful mountain rivers, including the Gallatin, mighty Yellowstone and the prairie meandering Gibson. The great thing about being based in Ennis is not only easy access to the touring, but also its close proximity to a variety of good wade fishing (I snuck off a few times inside the sightseeing) Valley Gardens offers a network of Madison side streams - brownie paradise for dry fly fisherman. Ennis Lake is 3700 hectares of crystal clear waters who’s Rainbows seem to chase anything. And for the more adventurous, the magnificent boulder waters below Madison Dam. All this within thirty minutes drive of Ennis. Next stop, Helena, one hundred miles north at the foot of the Rocky Mountain’s ‘Continental Divide’ (waters flowing either west to the Pacific or east to the Atlantic) Mike Geary, my friend and proprietor of Lewis and Clark Expeditions playing host for the next three days. The initial plan was Mike’s specialty - a camping and float expedition down the Smith River Gorge. But time wouldn’t allow, so we planned for three days on the Missouri and the Blackfoot. The latter providing the inspiration for Norman McClean’s novel ‘A River Runs Through It’. If the Madison’s scenery was all about epic Cowboy territory, the Blackfoot was its polar opposite. A smaller, secretive river winding through deeply forested valleys adorned by granite gorges and astonishingly sculptured rock faces. Setting out on our float conjured images of Lewis and Clark’s exploration of the river in the 1800’s, when tasked with opening up the northwest passage – prime Indian territory, just made for ambush. 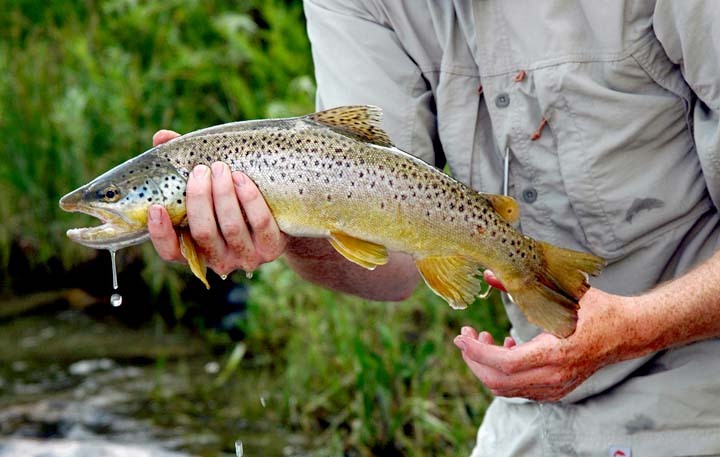 The Blackfoot is home to Cutthroats, Rainbows and Browns, and a 22 inch fish is considered a prize. Believe me, if using a 4 weight like I was, you wouldn’t want a bigger Blackfoot specimen on the end of the line. But this was one of those days when it wasn’t really about fishing, more to enjoy the wilderness experience. I lost count of the ‘hit it’ shouts from Mike, so absorbed was I in the float, the scenery and history of the river, not to mention the wildlife. Bald Eagles, Ospreys and Pelicans plundering the waters from above, foxes plying the banks for prey - deer crashing across stream not five meters from my fly. How the hell do you concentrate with all that going on around you! I missed countless takes, and caught many when I hadn’t even realized I’d tightened. By the time we’d banked the boat at the put-in, Mike had christened me ‘The Unconscious Fisherman’. But I just it put down to a relaxed style. Next day, the famous Missouri, the longest river in America (it drains about one-sixth of North America’s continent over its 2400 miles length). The put-in was close to the headwaters, its varied size and terrain reminiscent of both the Madison and Blackfoot, yet entirely it’s own character. But it was a typical weekend day, lots of boats (guided and private) populated by anglers of all hues. Serious faced guys in high tech gear, Cowboys in Stetsons, yeehaa-ing their catch. Families floating for fun and the scenery. In truth it was difficult to find holding spots not already occupied or hadn’t been thoroughly (and clumsily) fished through. For all that, we did catch fish, including some good ones. But the day’s real enjoyment was in being part of a Montana fishing Carnival and in the colorful characters populating its floats. The weekend over and the crowds died down, for my last day I opted for a return to the Missouri: no Carnival, no guide; just waders, my four weight and me. Mike suggested a spot he’d pointed out on the float: an ironwork bridge spanning a broad stretch of river with long shallow banks, open prairie either side and mountains on guard at the far border. He warned it would be difficult, being close to an R.V area and put-in point. But on a quiet day (which it was) there were good prizes to be won. And from my vantage on the bridge the signs looked promising; an abundance of dimpling rises to a prolific Tricho hatch. I swooped down on the river like a descending bald eagle (unfortunately, bald being the only similarity). But boy were those fish picky, taking everything but my dry. Then I twigged, they’d switched to feeding just sub-surface. On went a small suspended nymph - and bingo! A gentle sip, then savage reaction, the fish shot across the river like a silver bullet and in seconds I was down to the backing for the first time in my life. When I eventually gained some control, I tried playing it off the reel, finally losing it through clumsiness. But the fishing gods were with me. Another take, followed by the same thrilling combat. And no way this aerial gymnast was escaping the net! Five minutes later I was cradling a twenty two inch plus specimen in the shallows, hands shaking with excitement, huge grin on my face - an obliging bystander recording the event. My only fish of the day, but what a handsome prize to sign off the trip. And now I’ve finally overcome a long standing prejudice. I’m utterly hooked on the fighting qualities of indigenous wild Rainbows. Unlike the stocked version fished for in our European waters, these Montana ‘Bows’ are the real deal - the genuine, Wild West McCoy! 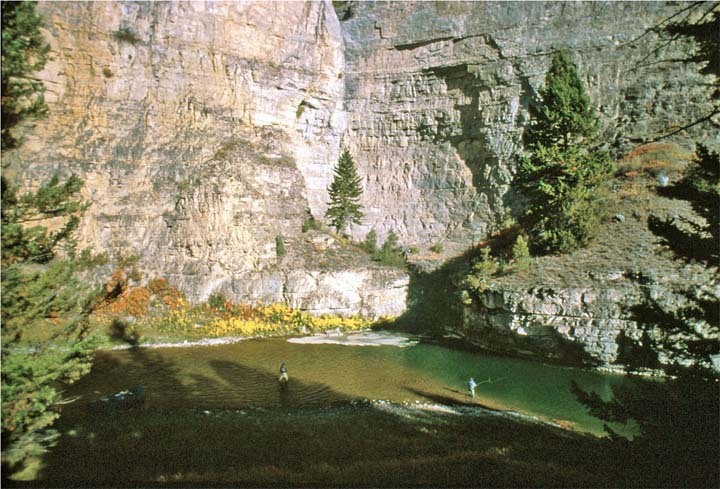 I’ve also become obsessed with returning next season for one of Mike’s float/camping trips down the Smith River Gorge: sixty miles of genuine wilderness fishing with no road access from put-in to take-out. This five day trip is also the basis of Mike’s charitable rehabilitation course for American army veterans, wounded in mind and body by their experiences in Iran and Afghanistan. It offers a unique and unpressured environment in which they can share (and hopefully) expurgate some of their more traumatising experiences. And wouldn’t some of our boys benefit from one of these trips: sharing their common experiences and laying their own ghosts to rest through interaction with their American counterparts. Like they say – fishing can offer so much more than just catching fish. Any patriotic sponsors out there listening?